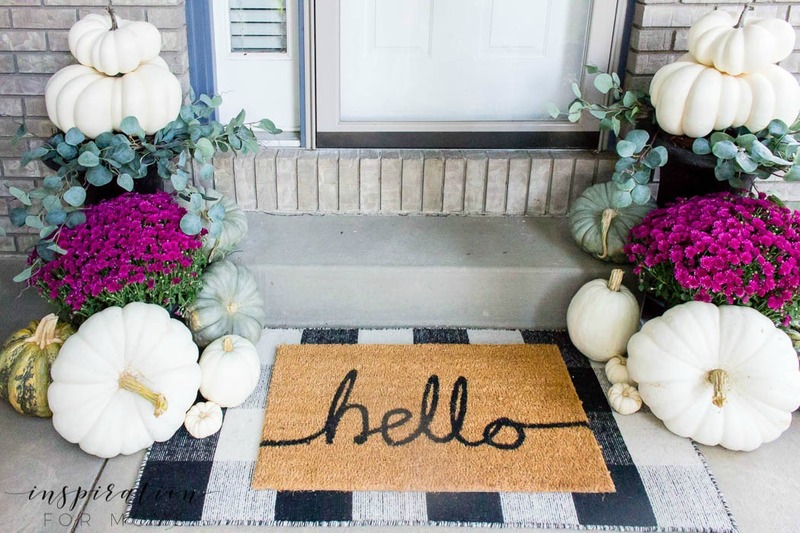 Give your front door a stylish new look by simply adding a few layered door mats. 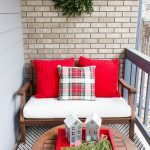 After I shared my fall front porch last week (see it HERE), I got some questions about my layered door mats. Door mats can start to look old and tired pretty fast if you have lots of company or it’s exposed to weather. 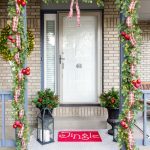 But lucky for us, updating the front door with a new pair of layered door mats is easy enough to do! 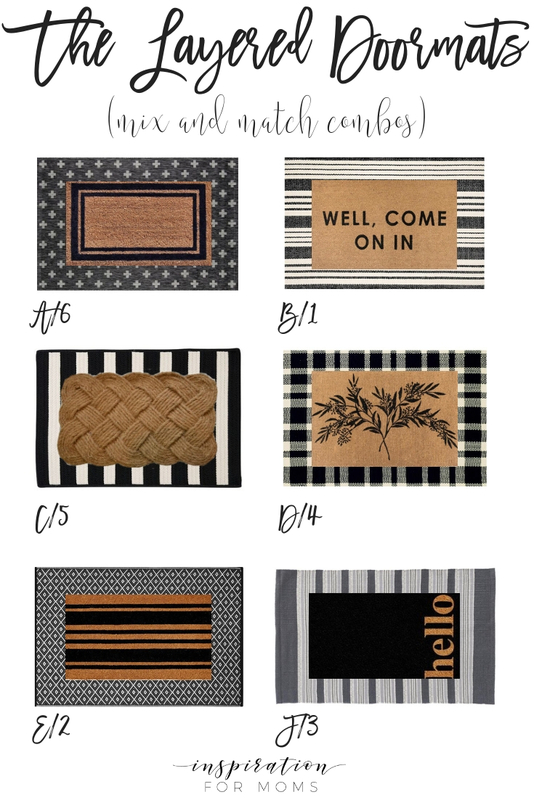 Layered door mats have become a hot trend lately and I can totally see why. The combo of a stylin’ rug with a mat on top creates pretty functionality to the front door step. And who can argue with pretty functionality? Not even your husband! 😉 That’s right, so I’m here to help you! 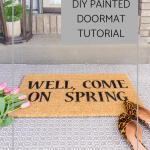 I’m going to show you all my favorite rugs, door mats and how to combine them to get the perfect layered door mats for your front door! Start with the base layer first. 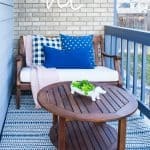 You know how I love my neutral colors and that is especially true when it comes to these outdoor rugs. All of them are styling with bold patterns or stripes. You can’t go wrong with any of these choices! D is my personal favorite. 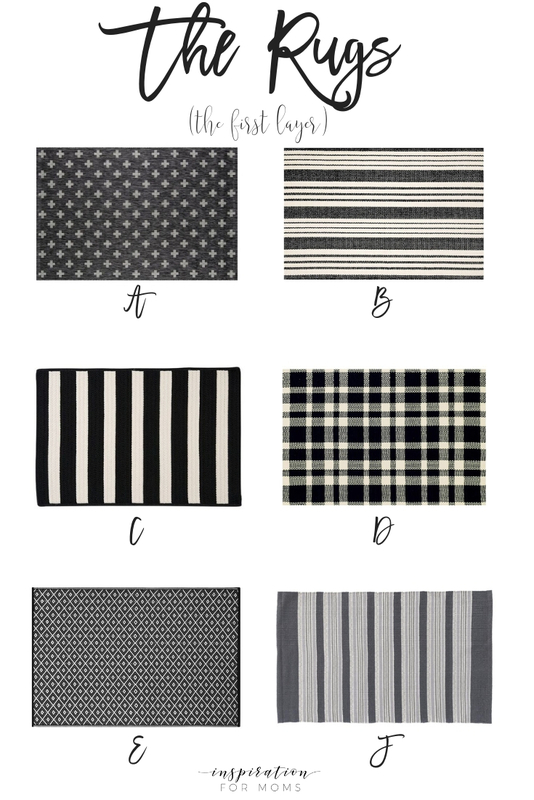 There are a few things to keep in mind when shopping for your rug. One is size. I generally like the rug to be sized around 3′ x 5′. If you go smaller than that you risk the door mat on top covering all of the rug. And that’s not the look we want. The second is style. The rug is a great item to play around with pattern and color. I like to go bold here with big stripes or check patterns. I know the doormat I place on top will calm the rug down a little. So get out of your comfort zone here and go playful! I have found a great selection of fun door mats. Some are super simple with a neat design and some have messages. But all have style! When looking for a great door mat, stay within the 2′ x 3′ size. That way it will fit perfectly in the center of your favorite outdoor rug. Now all that’s left to do is combine them. I paired all six below to show you how easily it is to mix and match. My personal favorite is D/4 and B/1. You can’t go wrong with any combo really. So I encourage you to have fun and happy layering! 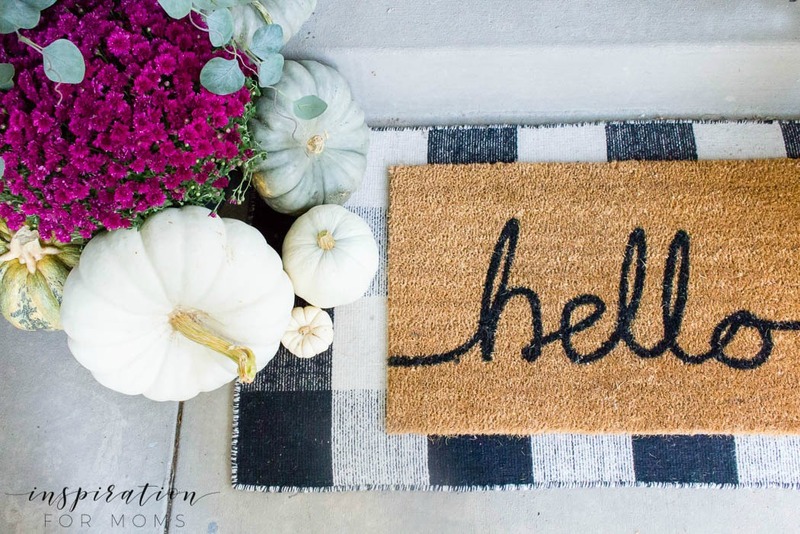 And when you do, be sure to tag me on Instagram with @inspirationformoms so I can see your so pretty layered doormats. UPDATE!! 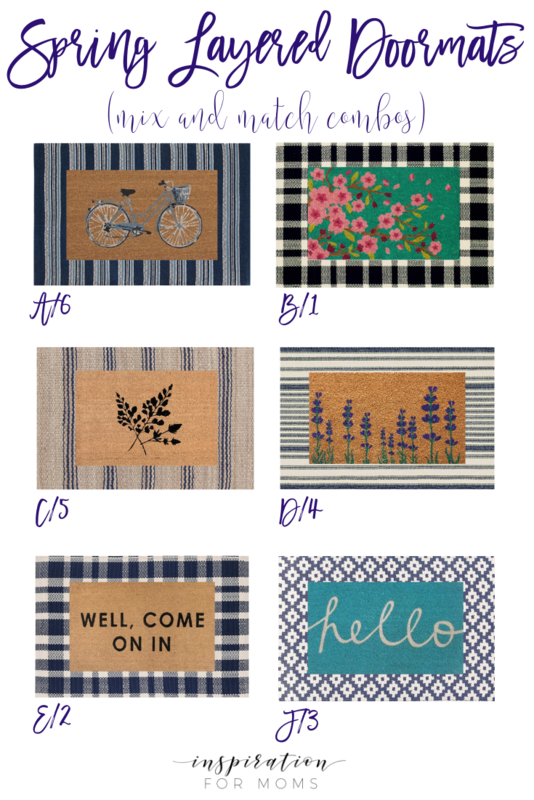 I have just created some new layered door mat combos for spring! 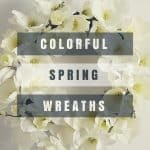 Just click here to see and shop the combos. IF YOU LOVED THIS POST, PLEASE PIN IT SO THAT OTHER’S CAN FIND IT AS WELL! You have inspired me to try a bold rug under my doormat!! 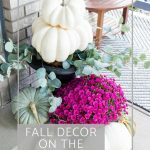 I have the same colored mums and white pumpkins, so I know it will be the pop of fun I need. Thanks! I love the idea of layering rugs. 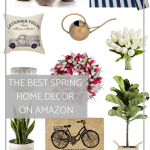 Your front porch looks charming! I hope you are enjoying a lovely October. I love this idea! Wondered what your opinion is on double doors? The doormat thing is always tough! Do you span both doors? Or leave one feeling naked? Hi Jill! I think if I had double doors, I would just do one big rug spanning both doors and then get a mat that’s a little longer than the traditional size. And place that center in between both doors. Then no door has to be naked. 🙂 Hope that made sense. 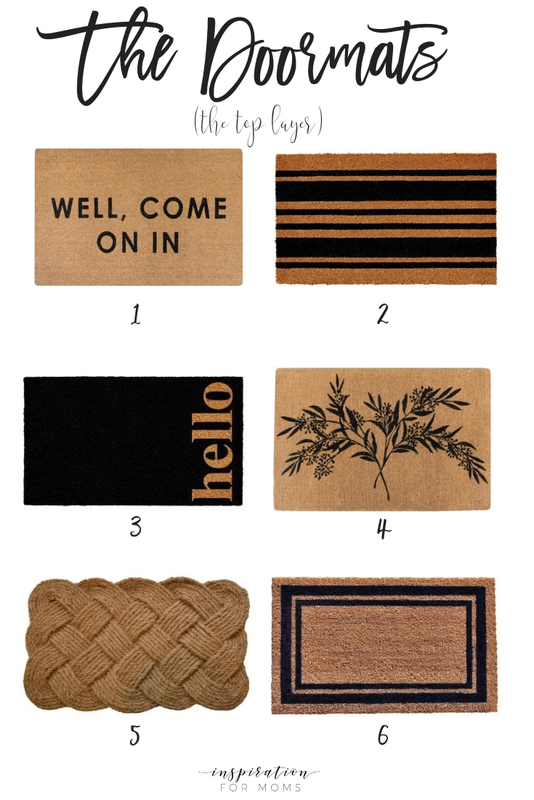 If you get on Pinterest — search ‘double door mat ideas’ and I think you’ll see a few examples of what I’m describing. Happy Layering!